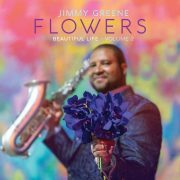 Jimmy Greene: "Flowers: Beautiful Life—Volume 2"
Like Beautiful Life, its Grammy-nominated companion album of 2014, Flowers was born of deep, unimaginable grief, following the death of saxophonist Jimmy Greene’s 6-year-old daughter, Ana, who was murdered at Connecticut’s Sandy Hook Elementary School in 2012. But whereas the previous recording was soulfully elegiac, “Flowers” is often joyfully kinetic—a rhythmically vibrant, sometimes harmonically audacious expression of love, inspired by a young girl’s passion for dance. A reed section unto himself, playing soprano, alto, tenor and baritone saxes, Greene thrives in the animated company of a stellar lineup that includes keyboardists Renee Rosnes and Kevin Hays, bassists John Patitucci and Ben Williams, and drummers Jeff “Tain” Watts and Oscar Brown III. “On this album, I envision Ana asking us to dance with her,” Greene informs us in his liner notes, and it’s not hard to imagine a child’s loose-limbed response when he and Brown vigorously spar on “Stink Thumb,” or when the reedman matches wits with Watts on “Fun Circuits” and “Stanky Leg.” Not that the session is without tender moments. Vocalist Jean Baylor helps fashion a poignant interlude on “Someday,” with words and music by Greene. Singer Sheena Rattai is similarly expressive on the album’s title cut. Strains of blues and samba also help throw the uptempo pieces into sharp contrast. From the Jackie McLean-tinted opener “Big Guy” onward, Greene plays with assurance and clear purpose while providing his colleagues with a winning selection of fresh tunes.